There is currently no screening tool to detect ovarian cancer at its early stages - help fund vital research to develop one, and save lives. Detecting ovarian cancer in its earliest stages gives women the best fighting chance against the UK’s deadliest gynaecological disease. Despite this, there is still no screening tool: you can help change this. 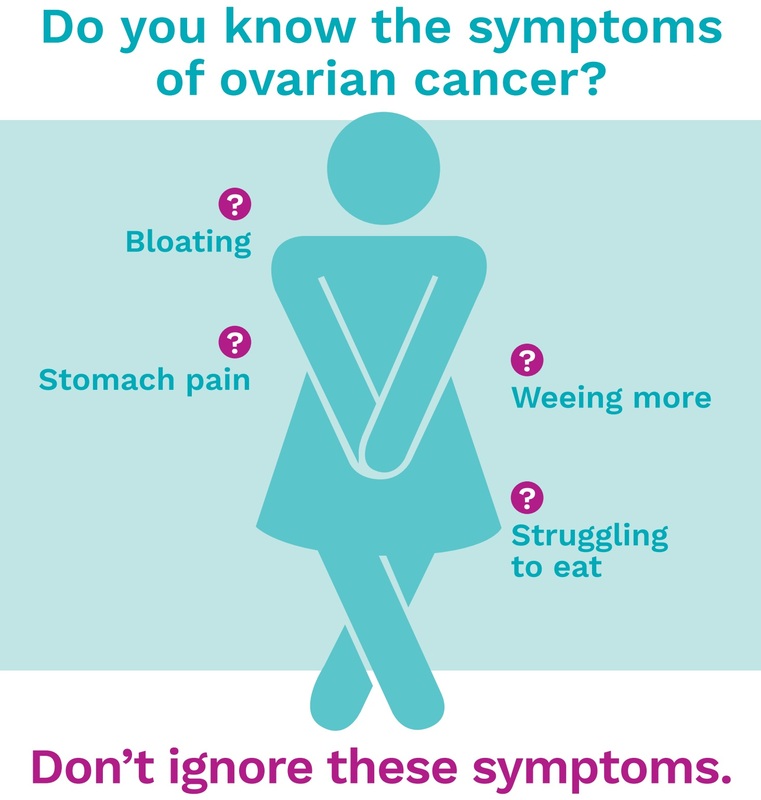 When ovarian cancer is detected in its earliest stages, women have a 90% chance of surviving beyond five years; this plummets to as little as 4% when detected at its most advanced stage. Unlike cervical, bowel and breast cancers, there is still no reliable, effective screening methods. This along-with low symptom awareness means that 75% of women are currently being diagnosed in these advanced stages. Women deserve better: a screening tool would change this. Your support is vital to developing research into the world’s first screening tool for ovarian cancer, a disease which kills 140,000 women every year around the world. 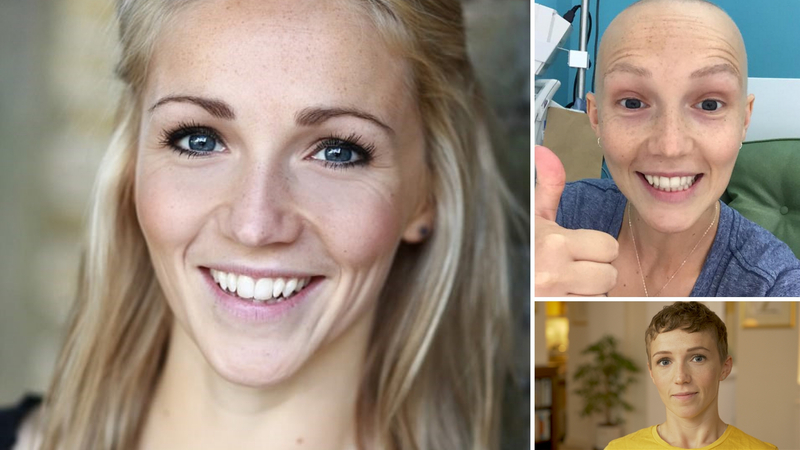 Suzie was diagnosed with ovarian cancer at just 25 years old. She believes an ovarian cancer screening tool is the key to saving women’s lives. “Towards the end of 2016, I started experiencing persistent bloating and constant exhaustion. At the time, I didn’t realise that these were ovarian cancer symptoms, and put it down to my busy lifestyle. However, by Christmas, where I’d usually be the life and soul of the party, I was so tired that I slept through most of the celebrations. Luckily, when I sought help, the nurse practitioner I saw acted quickly, ordering blood tests. The results indicated that something was wrong, and an ultrasound revealed a large mass growing on my ovary. I required urgent surgery and also lost my left ovary. Despite being initially reassured it would most likely be fine, I was told the devastating news that the tumour was cancerous. Further tests then showed that the cancer had spread to my lymph nodes. I was diagnosed with advanced ovarian cancer, aged 25. I was devastated. It felt so unfair, not only on me but also on all my friends and family, who put their lives on hold to support me through treatment. I underwent six gruelling rounds of chemotherapy. Whilst it initially disappeared, after three months I was told the cancer had come back, this time around my bowel. I’m currently on a clinical trial, which is helping me manage the cancer and I am determined to make sure every day is a good one. Not everyone is as lucky. Thanks to our dedicated supporters, in 2014 we began funding Professor Ahmed and his team at the University of Oxford, in partnership with the Betty Messenger Charitable Foundation. 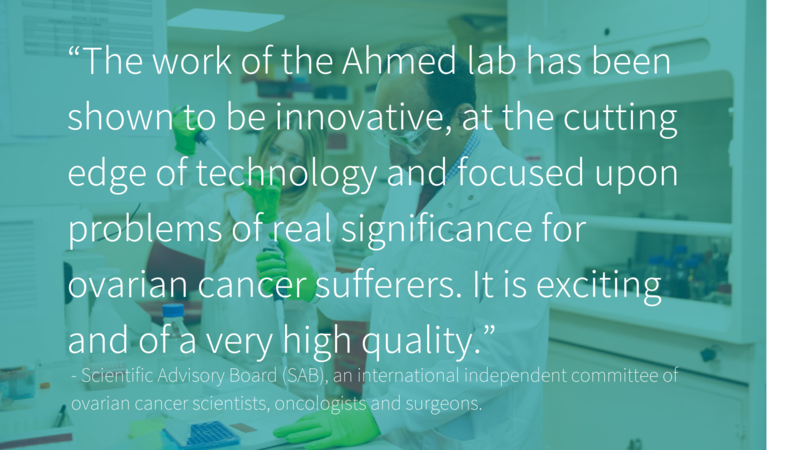 An award winning, internationally recognised expert in the field of ovarian cancer research, Professor Ahmed has led his team and made exceptional discoveries that could fundamentally change our approach to fighting ovarian cancer. This is very exciting; if we can learn more about SOX2 or find something similar, this could be used to develop a test to detect if ovarian cancer cells, or pre-cancerous cells, are present in a woman. We want the test to also detect these cells before they even develop into ovarian cancer, similar to how the cervical smear test works. Since the introduction of a screening programme for cervical cancer, mortality rates have reduced by up to 71%, preventing at least 2,000 cervical cancer deaths every year in the UK. We now want to replicate the success of the cervical smear test so that women at risk of ovarian cancer can be saved too. Your support will mean that Professor Ahmed and his team will be able to work on better understanding the exact location of these biomarkers in the fallopian tubes, how they behave and how to test women for ovarian cancer in the simplest way. By contributing today, you can be a key part of one of the most exciting developments in ovarian cancer research, which has the potential to save thousands of lives globally. Thanks to our incredible supporters and partners, we have already raised most of the funds needed. We are now on the last push to raise a further £255,000 so that Professor Ahmed can complete this project and we need your help! £20: Can provide a researcher with two months of protective-wear, preventing cross-contamination. £50: Can buy 100 specialist flasks which are necessary to grow cancer cells to be analysed. £100: Can buy 10 weeks’ worth of nutrients needed to cultivate cancer cells for further study. £250: Can allow our scientists to extract DNA from 100 samples of blood & cells. £300: Can buy a 12 month software subscription, used to create images and figures for publication. £1,000: Can buy a powerful computer to help plan & analyse knowledge gained from the experiments. Ovarian Cancer Action is the UK’s leading ovarian cancer research charity, investing in innovative projects that tackle the major problems faced by women with ovarian cancer.Together, we can stop women dying of ovarian cancer.  Your support is vital to the development of a screening tool. We need you to help show the world that women deserve better. Please help fund research that can make a screening tool a reality. Until a screening tool becomes a reality, symptoms awareness is also key to survival. In honour of your generosity, we’d include your name in our Roll of Honour on the Ovarian Cancer Action website and in our annual report. You’d also receive a video thank you from Suzie and Professor Ahmed, and appeal and research updates. You will receive a thank you video from Suzie, who will tell you why this means so much to women like her. You’ll also be thanked from Professor Ahmed for joining the fight against ovarian cancer. You will also receive updates about the progress of the appeal and research. To recognise your generosity in funding this crucial research, you’ll receive an exclusive Ovarian Cancer Action Screening pin badge. Additionally, you will also receive a thank you video from Suzie and Professor Ahmed, and be updated regularly on the appeal and research. Be the first to be invited to Ovarian Cancer Action’s exclusive events. You’ll also receive a thank you video, updates about the appeal and your name on our Roll of Honour. Take part in an exclusive tour of Professor Ahmed’s lab at the University of Oxford. Find out more about the science behind the screening tool research, meet his award-winning team of scientists and see first-hand the impact your donation can have.